For his work as the Program Co-chair of the 11th IEEE International Conference on Networking, Architecture, and Storage, known as NAS 2016, Darren Kerbyson, Associate Division Director of PNNL’s High Performance Computing group and Laboratory Fellow, was honored with an Outstanding Service award. The Program’s General Chair Zizhong Chen presented him the award during the NAS 2016 activities. 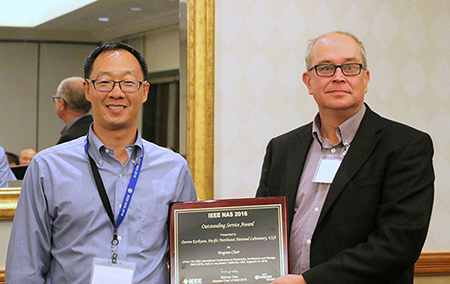 Kudos to Darren Kerbyson (right), whose work on behalf of the IEEE NAS 2016 conference was deemed “outstanding” by his peers. As Program Co-chair, Kerbyson led efforts to organize the event’s technical program. Fifty-six papers were submitted to three different program tracks—networking, high-performance computer architecture, and parallel and distributed data storage technologies. Of them, 22 full papers, nine short papers, and six submissions (posters) were accepted. A separate call for posters added 11 more, included as extended abstracts. Work on the NAS 2016 conference organization began in 2015, and Kerbyson coordinated efforts among more than 60 members of the program committee, as well as contributed to the final decisions regarding which papers and posters were included for publication and presentation. At the three-day conference, held August 8-10 in Long Beach, Calif., he supervised execution of the technical program.